By installing an on-demand recirculation system, you can get hot water from your taps quickly, without wasting too much water, energy, or money. Is one right for your home? Read on to find out. You’re standing over the kitchen sink or next to the shower, all the while waiting, waiting, and waiting for the hot water to arrive. Believe it or not, throughout the day those scattered moments of running the water add up to a substantial volume. In fact, the Department of Energy estimates that the average household wastes as much as 12,000 gallons per year due to delays in hot water delivery. And of course, water isn’t the only thing going down the drain—dollars are too. The root of the problem is, the hot water within the pipes serving the fixtures at the farthest reaches of your home gradually cools down. So, when you call for hot water it’s the now-cool water in the pipes that comes out first. To save time and money, not to mention water, many homeowners choose to install something called an on-demand recirculation system. The technology includes a pump, installed at the water heater, which speeds the transmission of hot water to the point-of-use fixtures located farthest away. The system also incorporates a valve that sends back to the water heater any water in the hot-water lines that has cooled down below a certain threshold. It’s an ingenious solution, particularly given the inefficient way conventional plumbing conveys hot water to fixtures like sink faucets and shower heads. Recirculation sends cooled water back to the water heater to be reheated and reused, and the system pump ensures rapid delivery, so you can enjoy instantaneous hot-water comfort. Are you intrigued enough to consider installing a recirculation system in your home? If so, keep in mind that there are two main types, each with its own set of installation requirements. Simply put, one type requires a separate plumbing line for cooled water returning to the water heater, and the other does not. The distinction may sound subtle, but in a retrofit application, it’s the difference between easy, nonintrusive installation and a much more ambitious project requiring opening up walls and putting in new plumbing. Because of the installation work they entail, systems involving a dedicated return line are best suited to new home construction. In existing homes, O’Brian advises, focus on kits like the Hot-Link from Taco. “Installing the Hot-Link can even be a do-it-yourself project for a handy homeowner,” says O’Brian. 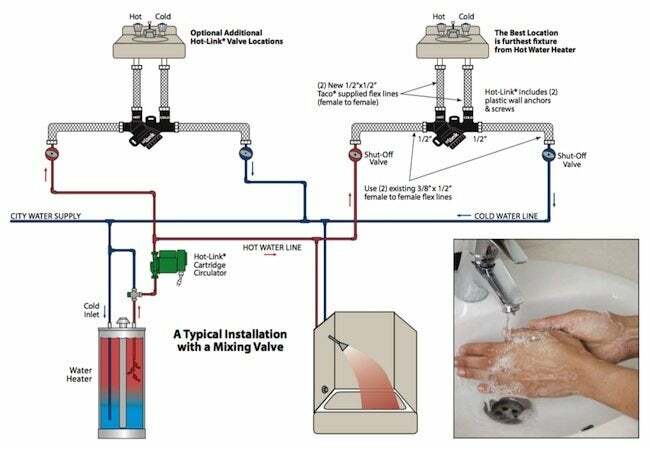 “Simply install the pump at the water heater, and mount the valve under the sink—no under-sink electricity needed.” A thermal disk within the valve serves as the brain that dictates system operation. 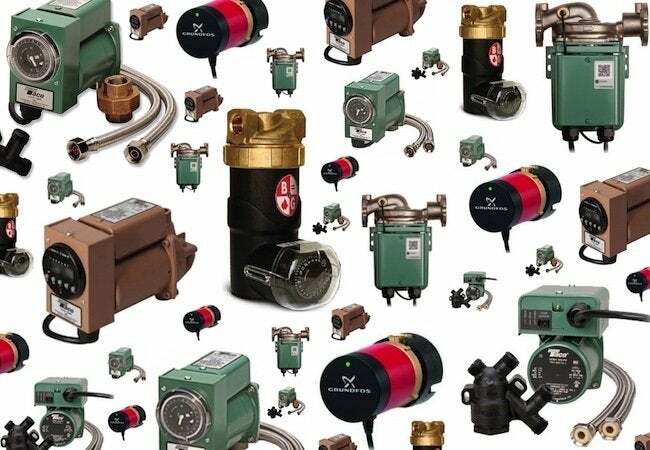 The most basic recirculation systems start at around $150, while fully featured retrofit kits like the Taco Hot-Link run in the $250 to $400 range. Of course, as in any product category, there are a number of models on the market, each of which comes with its special set of advantages. Do you need help selecting the right system for your home and your needs? The online retailer SupplyHouse.com offers a wide selection, and its experts are always on hand to offer best-in-class customer assistance.